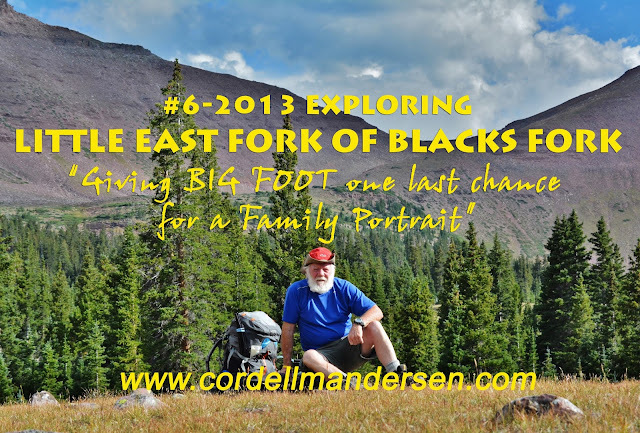 YouTube video #6-2013 BIG FOOT up Little East Fork? From August 13-17 I accomplished this backpack up mysterious Little East Fork of Blacks Fork, up over 11,742 foot high Squaw Pass and down to Oweep Basin’s 11,300 ft. high Porcupine Lake where I caught the most colorful Eastern brook trout I have ever caught. 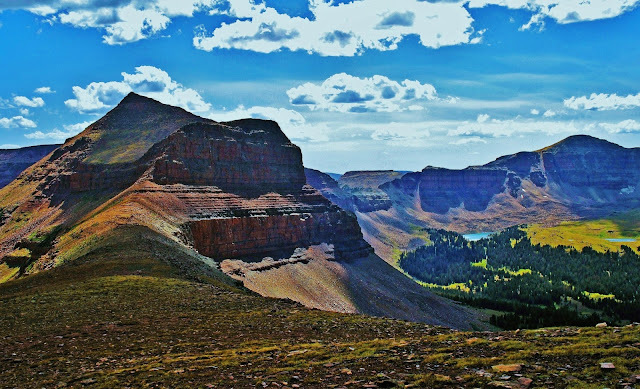 Slow acclimatization to the alpine elevations–that has become a problem I have had to work patiently with in my 78th year, had me taking longer (3 days) than hoped for to get to Porcupine Lake. This forced me to forget my plan of continuing over Porcupine Pass to test the waters of 3 no-name lakes in the upper Garfield Basin. Likewise I had to cancel my plan of going in the other direction to Crater Lake. Thus, the decision to go back over Squaw Pass and down Little East Fork with the idea of giving BIG FOOT another chance to find me. This resulted in two incredible BIG FOOT related experiences shown in this YouTube video. ENJOY! NOTE: Going alone had me taking all the following precautions: (1.) Topo map and route posted on my website; (2.) Using daily my SPOT Tracker so all would know I was alright and exactly where I was on Google Earth; (3.) Having a SKYCALL satellite phone for emergencies and for reporting in on KSL Outdoor Radio; (4.) Carrying all the stuff needed for “old guy” emergencies, even to suture and treat a wound and more; and (5.) always hiking with great caution realizing I couldn’t afford to take a mis-step or make a mistake! NOTE: I had an incredible backpack up to Squaw Pass and down to Porcupine Lake, then back to give BIG FOOT one more chance for the Family Portrait–and had TWO personal experiences….then met a whole bunch of new, beautiful High Uinta Friends–and within a day or two I’ll have online the YouTube video you will all enjoy. Then on to LONETREE and on to the site of the first Rocky Mountain Man Rendezvous on the Uinta’s Henrys Fork River, and to Manila, Utah, but it was in Lonetree I learned that great things can come from a tiny place on the map–and that will be within a few days another YouTube video or two that came from a miraculous encounter! I’M NOT KIDDING! I will advise all of each new creation, the opening of the first being….. NOTE: This backpack, outlined below, is a relatively tough one for someone my age–going on 78–and so will be attempted with great caution. I will proceed in accordance with how my body adjusts and adapts to the rigors encountered. I carry with me and use daily a SPOT Personal Satellite Tracker, and a satellite phone. I leave with my family my phone number and a time when I have it turned on each day in case the family needs to call me. As you can see below I leave a map showing my route. All of these things should be done to be safe in the mountains. On Monday, August 12th, I will drive to the East Fork of Blacks Fork Trailhead and on August 13th head up Little East Fork. I will bushwhack up to the above timberline lakes in that drainage and go cross-country to Squaw Pass. NOTE: I have always been fascinated by the handful of remote, above timberline and off-trail lakes in this area and hope to be able to get to them, test their waters for fishing, get some good photos and report to all of my High Uinta Friends. 1. If there is any doubt about my conditioning to safely proceed I will just return to the Trailhead following the trail down Little East Fork. 2. If I feel up to it I will climb Porcupine Pass (2nd highest in the UIntas) and test the waters of three no-name lakes, seen below to the center-left, above North Star Lake in the Garfield Basin. NOTE: Again these 3 lakes have escaped me inspite of having gone by them quite a few times. I would hope to not rest until I remedy this mistake, test the fishing, get some good photos, and report to all of you. I will then return to the Trailhead following the trail over Squaw Pass and down Little East Fork. 3. 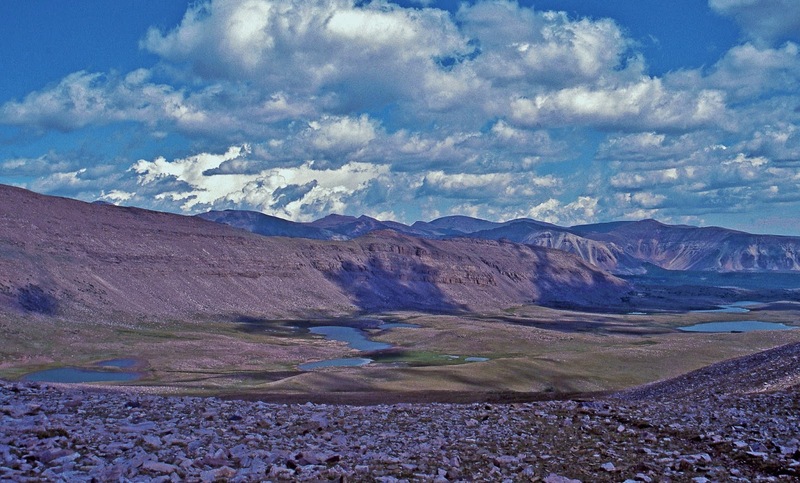 If I feel in superlative condition I will go from Porcupine Lake west to Lambert Lake and Meadow and from there to Crater Lake, seen below, to try one more time for that perfect photograph of the Uinta’s deepest lake (147 ft.). I will return via Red Knob Pass, East Fork Pass, a spectacular area seen below after the Crater Lk. picture, and then follow the trail down East Fork of Blacks Fork to the Trailhead. Remember to listen to my satellite phone report to KSL Outdoors Radio on Saturday, August 17th, at about 6:40 A.M.
For your safety and that of your group you can rent a SPOT Personal Satellite Tracker, and satellite phone from Russ Smith at SKYCALL SATELLITE.